If you are not familiar with SkinnyTaste be sure to check out her website for some brilliant recipes that will help keep you on track with a healthy lifestyle. I made a gluten-free version of her Cheeseburger Casserole and my family enjoyed this recipe. I will be whipping up this dish again in the near future. Keep reading to hear more about this unique casserole dish. What I really loved about this recipe from SkinnyTaste was the simplicity of creating it. The recipe was easy to follow and the ingredients were very simple to prepare. I started out by boiling the pasta and browning the beef. There was very little prep involved. I used two shallots in this recipe and had to slice those, easy peasy! The recipe calls for garlic as well and I just use my trusty Spice World squeeze bottle. I love simple recipes… who doesn’t?? They are wonderful on busy weeknights or when you are feeling too lazy to cook. Gotta have my grass-fed beef in my Cheeseburer Casserole! I recently made the switch to grass-fed beef. Grass-fed beef is not only more beneficial to your health but I believe it tastes better than regular beef. The grass-fed beef that I purchase at Kroger is also organic. That means that the cows graze on pesticide-free grass. Grass-fed cows also mean that the meat is free from added hormones that are typically given to cows. Sometimes I think of my body as an automobile. Your body needs good to fuel to run. You don’t want to put crappy fuel into your car so why would you want to put bad fuel into your body? Grass-fed beef costs a bit more than regular beef but I believe that the added benefits are worth the extra cost. I made a few modifications to her recipe for my family. Instead of using an onion I used two sliced shallots. I discovered shallots earlier this year and prefer their taste and often swap onions for shallots now. I also incorporated some onion powder to the meat while browning it. I love the added flavor that onion powder lends to ground beef. Also, instead of using Dijon mustard I went with my favorite mustard by Boar’s Head. The mustard is a Delicatessen style and it gave the dish a wonderful flavor. Another swap that I did with this dish was that I used gluten-free noodles. I use Kroger’s ClickList and wanted some rotini pasta but they were out of stock and they gave me penne pasta instead. That was fine with me but I do think that rotini would have been best. I used Ronzoni brand and I believe that they do make a very tasty gluten-free noodle. I don’t think they taste much different than regular pasta. This dish would have been great with Banza’s chickpea pasta as well. They are another one of my go-to brands for gluten-free pasta. A great cheeseburger has to have great cheese. I love Tillamook’s shredded cheese and I ended up pouring the entire bag of cheese all over this Cheeseburger Casserole. The recipe calls for 2 cups of cheddar and the one bag of cheese was equivalentÂ to two cups. I used a sharp cheddar and this was a great choice for the casserole. Tillamook creates some damn good cheese. It is my go-to brand for shredded cheese. I also use their mozzarella on my homemade pizzas. They take great pride in creating their cheese and I can always rely on Tillamook to deliver a quality product. Who would have thought that pickles would be an acceptable topping on a casserole dish? I’m telling you guys, this works and the pickles actually turned out to be my favorite part! Any type of pickles will work well with this casserole. I ended up going with bread and butter pickles. Dill pickles would we splendid on this as well! I was so excited when my oven beeped and my casserole was ready to dig into. Check out that ooey, gooey melted cheddar, OMG! I love anything with melted cheese on it and this recipe did not disappoint. When the casserole came out of the oven I topped it with some bread and butter pickles. This dish was love at first bite. The cheeseburger really translated well into a casserole dish. I was amazed! This is a dish that I would gladly make for my family again since we all enjoyed it. My daughter, Chloe, really enjoyed this recipe and she really got a kick out of those pickles that we topped the casserole with. Pickles are an ingredient that you wouldn’t normally use in a typical casserole. For us, the pickles were actually our favorite part of this dish! The more the merrier! The next time I whip up this recipe I will definitely be adding an abundance of pickles on top! SkinnyTaste was created by Gina Homolka. She is an author, recipe creator, and a photographer. She is a pro when it comes to the recipe world. SkinnyTaste began in 2008 and now has 3 million monthly viewers on her website… can you say goals?? I would love to someday achieve greatness like her. Her philosophy of eating is to eat seasonal, whole foods and to maintain portion control while eating. Her website has a wide variety of recipes for several different diets. I am sharing this with you today because her recipes are top-notch. Yes, I am a food blogger and yes she is a food blogger. I don’t see her as competition. When I fall in love with something I feel the need to share it with the world. I am sharing her recipe website because I believe in her philosophy and I like to encourage people to eat the right way. Does this look like a recipe that your family would enjoy? What other SkinnyTaste meals sound great to you? Leave me a comment and fill me in! You can see all of the recipes at SkinnyTaste on her website. The Cheeseburger Casserole recipe can be found HERE. 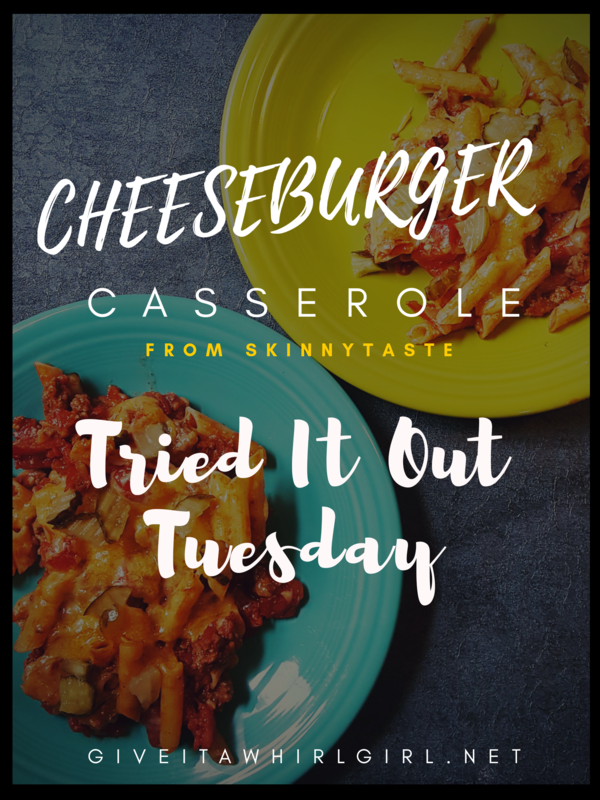 This entry was posted in My Cooking Journey, Tried It Out Tuesday and tagged Banza, casserole, cheddar cheese, cheeesburger, cheese, easy, garlic, gluten free, glutenfree, grass fed beef, muir glen, pasta, pickles, shallots, SkinnyTaste, tillamook, tomatoes, Tried It Out Tuesday. Bookmark the permalink.